Monday morning we woke before the sun to head off to Dalat. After spending the last month and a half almost entirely in hot, humid cities, we were both excited to see the lush, green countryside below the plane, and feel the cool breeze when we arrived. We took a thirty-minute bus ride up into the mountains (or onto the Langbiang Plateau to be exact), and found our hotel. In the early 1900s, Dalat was built as a resort for the French. Just as I had read, it retains a very European feel. The city is extremely hilly with curvy streets, long steps, and houses stacked into the hills. It is very well maintained and flowers, many that I had never seen before, bloom everywhere. When we arrived it reminded me of fall in Atlanta. The sky is only that certain deep shade of blue in the fall, and if it weren’t for the sun you would need a jacket. We were slightly amused the first day by how warmly the locals dress. The children wear knit masks that only leave their noses and eyes exposed, and the adults all wear winter coats and pants. As long as the sun was shining I was happy in my short sleeves and skirts. We stayed in a skinny, little hotel on a winding street that wasn’t anything bad or good, except the guy that worked the front desk was a really good source of information. He spoke excellent English, and would chat with us about Dalat, America, and Vietnamese people while he was frying eggs for our breakfast. Once we had arrived our first mission was coffee. We went next door to a café that was full of ladies drinking tea and chatting. I couldn’t convey that we wanted black coffee, so we got the regular coffee with condensed milk, except without the ice that the hotter cities require. The also brought us two glasses of warm, green tea. It’s very common to be offered tea when you walk into a business, or to be given some after your meal is over. I’ve gone into spas just to get a menu and before I can take it and leave they’ve brought tea for me. No matter how briefly you think you’ll be waiting, they still show up with tea. When Jonathan goes into the airport in between flights to file a flight plan sometimes they offer him a cup. I’m really learning to enjoy this tasty courtesy. After coffee, it was time for breakfast. A few shops down, we went ate at a noodle place recommended by the hotel guy. It was an open front store with a man standing behind a table/counter of food, and a lady delivering the bowls to the tables. Whenever someone would come in he would set out the number of bowls needed and quickly fill them in order of ingredients. The noodles were different than in pho. They were similar to spaghetti, but thinner and tasted different. On top of those he added a few dumplings, slices of roasted pork, chopped, fresh chives, crumbled pork bits, and then covered it all over with broth. The dumplings were my favorite part. With our caffeine needs sated and bellies full, we set out to conquer the town. I like how much more of a place you discover while walking. 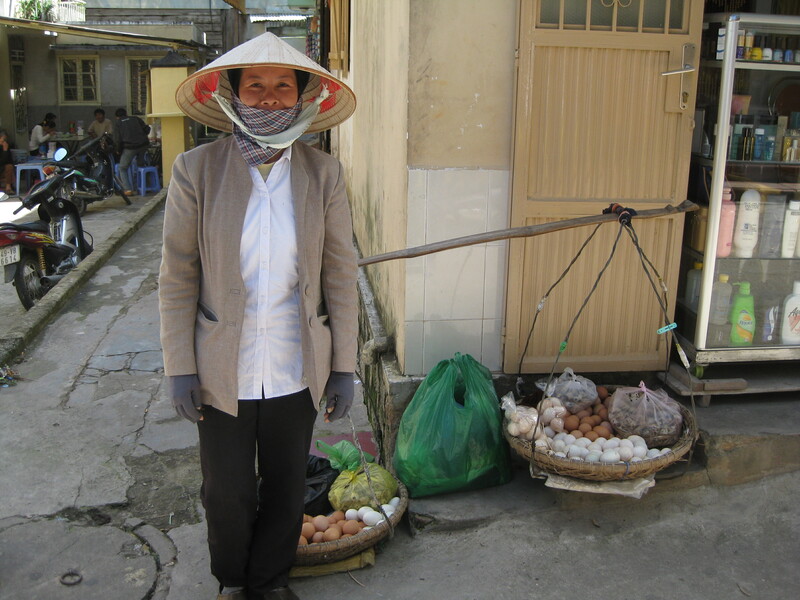 We wandered down alleys full of ladies selling vegetables, and I took a picture of a lady’s baskets of eggs that she carried suspended on each end of a pole. I showed her the pictures and she laughed so heartily that I asked if I could take her picture. She stood giggling behind her face mask while I took it, and then put one arm around my waist and held my other arm as we walked back up the alley. I felt very honored that she would bestow physical affection on me. Farther along the way, we passed a shop full of birdcages and singing birds. I’ve begun to notice that many homes and shops have a few birds. I asked someone why, wondering if it was some sort of luck charm or religious thing, and he replied that it was for fun. They listen to them sing, and sometimes they fight. He said all the birds look same same (a common phrase in Asia) to us, but to each other they are different. Our next destination was the Crazy House. I wasn’t sure if I would like it since adult hallucinations and creations rarely appeal to me, but we heard it was interesting. Part of it is made to look like a tree, some rooms are like caves, and it all twists and winds around together. A lot of back tracking was required so as not to miss anything. 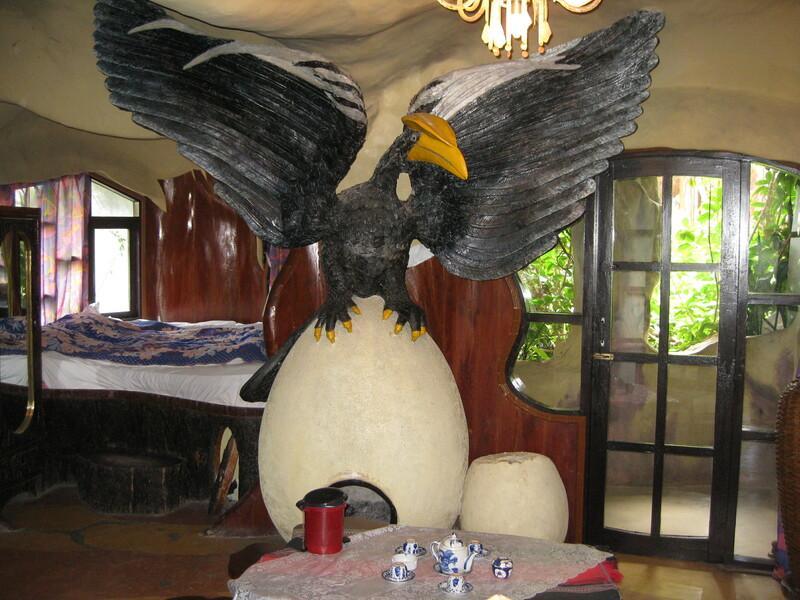 It is also a guesthouse and each room, ‘carved’ into the trunks and rocks, is strangely shaped and animal themed. There are few, if any, right angles in the building, and every bed and window is oddly shaped. They have been building it since at least 1990 and don’t expect for it to be finished until 2015. Jonathan said it felt like a grown-up tree house, and I did feel like a kid climbing all around – curious what was down the next stairs and where the next twisting walkway would take you. It wasn’t creepy or psychedelic like I had feared. I’m not saying I want to spend the night with a kangaroo with red light bulb eyes watching me, or make a fire in the egg of a crazy eagle, but it was fun. My biggest problem was my fear of attached heights. From the higher parts of the house you could see all the way across the city. There were tiny staircases climbing everywhere, and many of them barely had sides, much less railings. 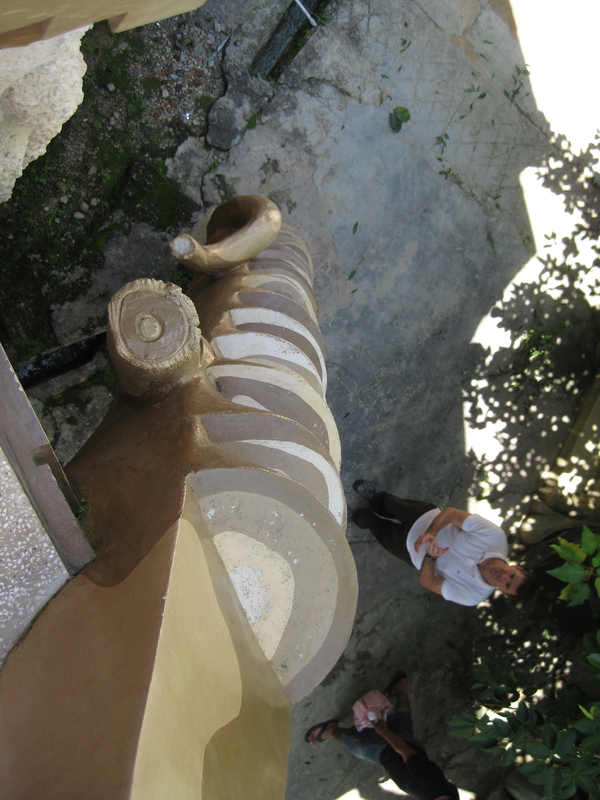 Some of the steps were so steep and narrow they were little more than ladders without rungs. A few walkways had nothing more than a knee-high wall between a fifty-foot drop and me. It was a stark reminder that I am not in the US where everything has to be handicap accessible and free of any possible way to get hurt. I’m not sure how I feel about the freedom to fall and break my neck. It was an excellent visit, and we supported the local minorities that sold their woven wares. 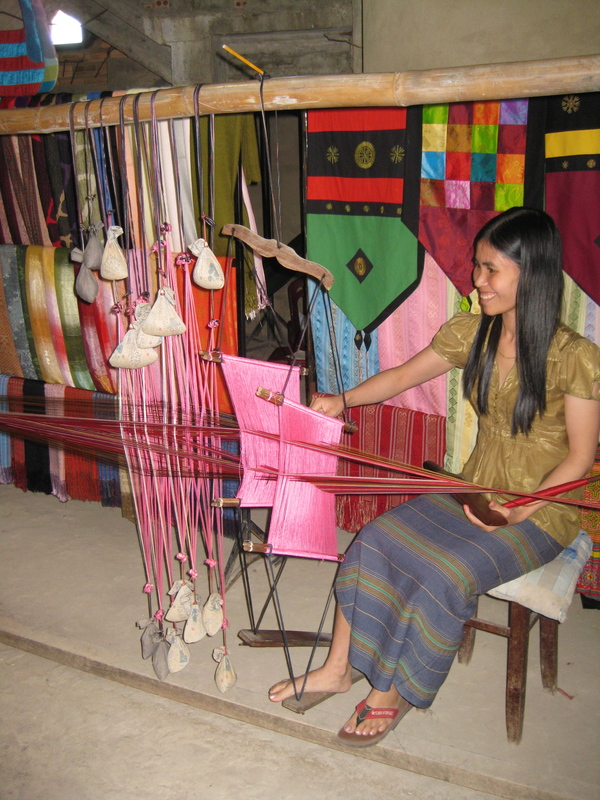 One of the rooms had a loom set up, and the lady explained and demonstrated the tedious and complicated method. There were so many parts to it – the pedal she pressed to shift the thread on the loom, the piece of wood used to pack each thread in, the eight or ten weights hanging from strings that she shifted every few times to change the pattern. It was overwhelming. These ladies learn to weave as little girls, and pass the skills on to each generation. We took the roundabout way home passing groups of school children on their way home. Many of the girls rode primly on their bicycles – one hand driving and the other hand holding the long, white ao dai. Most of the children wore navy pants and sweaters with a white shirt underneath. We passed groups of girls who giggled at us behind their hands, and paid a quarter for a bag of iced sugarcane juice with a straw rubberbanded in it. The lady put several stalks of sugarcane repeatedly through a machine so they were crushed and the juice ran into a bowl. After such an early morning and busy day, we headed back to the coffee shop. There were two ladies in there resting from selling dvds and what I suspect are lottery tickets. One was very outgoing and through signs asked how old we were, if we were together/married, and if we had children. She told us that she either has one four year old or four children. We could never figure that one out. I showed her pictures of our friends and families on my iphone, and we looked up all the words for mother, father, sister and brother (younger and older,) and friend. Sometimes I feel that when I try to say things in Vietnamese all I’m doing is providing a source of amusement for them. Day one in Dalat was beautiful, entertaining, and peaceful. Such a nice change from hectic, hot city life. 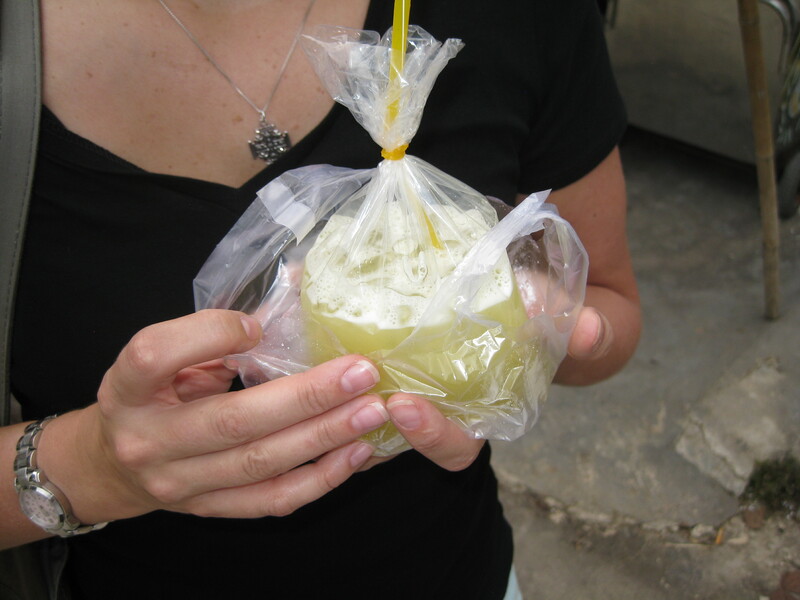 Was the sugarcane juice good – taste much better than a bag of sugar water? Is the local food spicy or what?